Winterizing: A Quick Review | Hupy and Abraham, S.C.
We all know we should winterize our bikes... but it can be easy to put it off a bit too long, making the situation worse for ourselves when the snow finally does thaw. Check out these quick tips below for a review of just how easy it is to winterize! Stabilizer: Add stabilizer to a full tank of fuel to ensure your bike is protected against the effects of rotting gas. Battery care: Either attach a battery tender, or if your bike is stored in a cold location, remove the battery entirely and transport it to a warm dry place and charge to full on a trickle charger every two to four weeks. 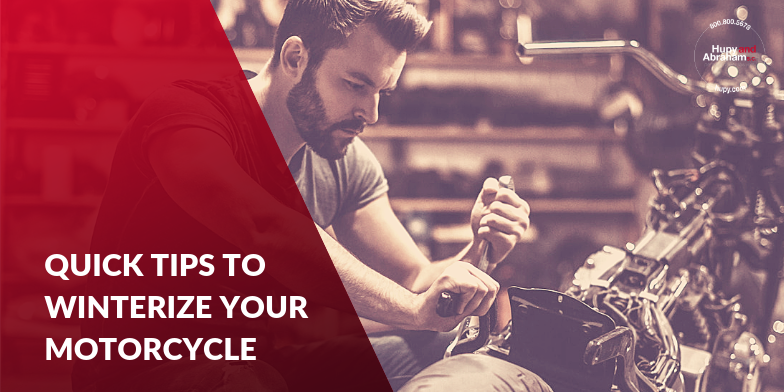 Oil and filter change: A fresh change, especially if more than one season old, will help ensure your bike is in top shape for spring. Store: Inflate your tires fully or put your bike on its center stand. For more great tips, check out our Behind the Handlebars video channel where we even have a step-by-step video guide to motorcycle winterization! Hupy and Abraham has been representing riders for over 50 years. We are a law firm that truly understands bikers! To learn more about motorcycle winterization and other great topics, check out our Rider Resource online here!